The Majestic Yosemite Hotel shines as Yosemite National Park’s distinctive AAA four-diamond hotel. Known for its stunning interior design and architecture, The Majestic Yosemite Hotel was specifically designed to highlight its natural surroundings, featuring Yosemite Falls, Half Dome and Glacier Point. The hotel holds a historic heritage as it is listed on the National Register of Historic Places and is a National Historic Landmark. The destination of queens and presidents alike, this distinctive Yosemite hotel offers a perfect balance of history, hospitality and elegance. The Majestic Yosemite Hotel offers a gift shop with a focus on local artisans, a decadent sweet shop, a comfortable bar and a heated outdoor swimming pool. The Majestic Yosemite Hotel Dining Room serves breakfast, lunch, dinner and Sunday brunch. NOTE: Advance reservations are strongly recommended for The Majestic Yosemite Hotel Dining Room. Click here to book your dining reservations. Standard Hotel Rooms: Comfortably appointed, these rooms typically face the rear of the hotel with limited view - a perfect choice for staying on budget while enjoying the luxurious amenities at The Majestic Yosemite Hotel. Classic Hotel Rooms: Classic rooms are finely appointed with lovely views of Glacier Point, Half Dome, or Yosemite Falls, as well as the hotel surroundings. ADA Classic Hotel Rooms: Select rooms are accessibility compliant, which include widened doors, grab bars in toilet stalls, raised toilet seats, and low-density carpet. Featured Hotel Rooms: Several rooms offer balconies with stunning views of Yosemite's most iconic cliffs and waterfalls. Balconies are most often shared with the adjoining room. Balcony sizes vary. The El Dorado Diggins Suite was at one time a private dining room, a cocktail lounge, and a chapel in the 1940s. This unique suite features a king bed and a sunken living room, large windows and a slate entrance way. The Mary Curry Tresidder Suite - called the Queen's Room since Queen Elizabeth stayed here on her visit to Yosemite in the 1980s - is ideal for honeymooners and rekindling old flames. The four-poser canopy bed and grand bathroom make for a decidedly romantic space. 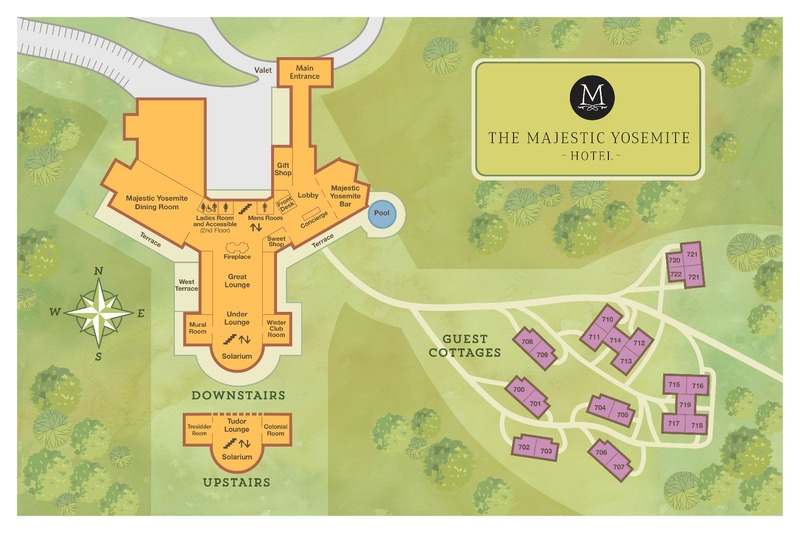 The Majestic Yosemite offers guests a choice of four parlors, which combine with hotel rooms to create luxuriously appointed suites with the best views at the The Majestic Yosemite Hotel. Standard Cottages: After a day in the great outdoors, nothing beats returning home to your Standard Cottage. Cozy yet plush with comforts, our four Standard Cottages have a king bed. ADA Classic Cottages: Some of Classic Cottages are accessibility compliant, with widened doors, grab bars in toilet stalls, raised toilet seats and low-density carpet. Featured Cottages: Staying in one of our two Featured Cottages is a true treat—as a roaring fire will set the mood for coziness and tranquility. A sitting area and small bathroom (shower only—no tub) keep things snug and humble. Business Center With multiple computers, a printer and a fax machine, our Business Center is perfect for productivity when you’re far from the office. Additionally, the Business Center offers concierge services during business hours daily. Some guests enjoy the same-day laundry service and room-service meals to give them more time to focus on the task at hand. Housekeeping & Concierge Exceptional service comes standard at The Majestic Yosemite Hotel. Our bell service is on-hand to take your bags to your room upon arrival and help you settle in. A full-time concierge can help with on-site planning and can provide maps, schedules and insider tips to get the most from your Yosemite experience. And, of course, daily housekeeping and room service complete the experience of convenience and luxury. Guests can also request our evening turn-downs are provided upon request. Our year-round outdoor heated swimming pool and daily Afternoon Tea are available to all The Majestic Yosemite Hotel guests. Parking The Majestic Yosemite Hotel offers complimentary valet and self parking. We recommend guests not staying in the hotel use the conveniently located Day-Use parking lot in Yosemite Village and use the free Yosemite Valley shuttle to get from place to place within the park. We are pleased to offer electric vehicle charging stations in the hotel parking lot, which one is a Tesla Motors charging station. For the most up-to-date dining Hours of Operation, please visit our dining page. Dinner reservations and proper attire are requested. Please contact our dining room reservations line at 209.372.1489.